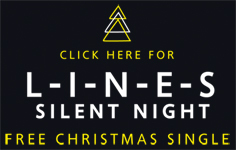 Jon Bilbrough: L-I-N-E-S : FREE CHRISTMAS SINGLE! L-I-N-E-S : FREE CHRISTMAS SINGLE! If you've been following this site for a while you'll be aware that I've been writing and recording tracks with Tim Wanstall from the band Athlete. Its been a great chance for me to express a whole other side of songwriting, backed by Tim's array of 80's synths, classical piano. We've had lots of fun layering... and layering my vocals, distorting them, and messing around with tape delays. The project is called L-I-N-E-S and the recordings are very nearly ready for next year! We've decided to kick things off with a Christmas Single, a dark but cheeky 80's version of the most famous carol there is... 'Silent Night'.